SCP-382-1, just after its discovery in [DATA EXPUNGED]. Special Containment Procedures: SCP-382-1 is to be stored in a standard Site-██ containment room, inside a 1.5 x 1.5 x 1.5 meter plexiglass box of 5 centimeter thickness, at minimum. A video camera is to be kept trained on it at all times, though this is merely for observational purposes. Due to the area of influence and deleterious nature of SCP-382's effect, it should only be removed from its enclosure for testing purposes, with staff observing from a remote location. The manifestation of SCP-382-2 has so far been confined to SCP-382-1, and therefore requires no special containment procedures beyond those already in place for SCP-382-1. See addendum 382-A. No personnel (Class-D or otherwise) should interact with SCP-382-1 for more than 2 hours, unless accompanied by at least one armed Agent. 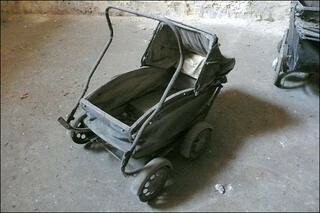 Description: In its inactive state, SCP-382-1 is a large baby carriage, manufactured in 19██ by █████, ██████████ & ██████ of ██████████, England. Its age shows; metal components are heavily rusted, the rubber of the tires is brittle, and the cushion is missing. SCP-382-2 appears to be an infant, between █ and ██ months old, extremely emaciated, with several injuries that seem to vary with each manifestation. On different occasions, SCP-382-2 has shown heavy bruising, broken bones, and sometimes [DATA EXPUNGED] despite which 382-2 could still make vocalizations, although it is unknown how this was possible. When SCP-382-1 is not being interacted with, SCP-382-2 manifests every ██ to ██ minutes, staying between █ and █ minutes. However, when a person places their hands on the handlebars of the carriage, 382-2 will instantly manifest, and the period of time of both disappearance and reappearance will decrease to approximately 1 second. Once the subject has perished, SCP-382-2 will disappear and SCP-382-1 will return to its former, derelict appearance within 30 minutes. On ██/██/20██, my research team and I began testing to determine whether a person of sufficient youth and physical fitness could sustain interaction with SCP-382 past the two hour mark. D-382-gtf87i was chosen for his age (only ██ years) and because he had been a physical trainer prior to [DATA EXPUNGED], and kept in shape throughout his incarceration at [REDACTED]. His exposure to SCP-382 proceeded as normal, though the physical degradation appeared to progress at a slower rate than previous test subjects. After the 2 hour mark, with D-382-gtf87i still living, though in extremely poor condition, SCP-382-2 manifested as usual, but did not disappear 1 second later. SCP-382-2 then [DATA EXPUNGED], consuming the then mummified corpse of D-382-gtf87i, and proceeded to [DATA EXPUNGED]. Fortunately, only one other Class-D was killed before SCP-382-2 was terminated by Agent ████████, but the event has necessitated the amending of the SCP-382-2's special containment procedures somewhat. I don't feel that this warrants a change in classification level.